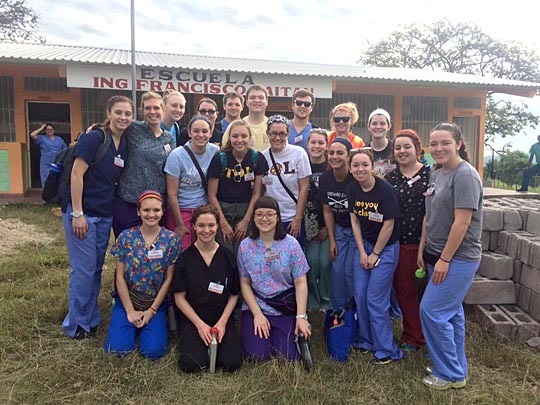 The University of Toledo chapter of Global Medical Brigades, the largest student-led undergraduate medical mission trip organization in the world, spent eight days over winter break in Honduras setting up medical clinics and seeing patients. According to Bailey Slone, president of the UT chapter, the organization treated around 850 patients during their eight days in Honduras. Students from the UT chapter of Global Medical Brigades posed for a photo with some peers from the University of Hartford in front of a school where they setup medical clinic in Tomatin, Honduras. “We were able to do more than we ever expected. We did not have to turn a single person away from medical care, and that was a major goal of ours,” Slone said. Twenty members of the UT chapter joined 10 students from the University of Hartford to expand the group and share the cost of the medications they took to Honduras. For both groups, this was their first time going on a brigade, so they worked together for the duration of the trip. Together, the students from UT and the University of Hartford were able to raise enough money to bring $8,000 in medication to Central America. They raised funds for one year before embarking on the brigade. According to Cole White, former president and co-founder of the UT Global Medical Brigades chapter, the average person in one of the Honduran communities the group visited lived more than 20 miles away from a doctor. “It so happens that [Bowling Green State University] is 22 miles away, which is a perfect example of the current situation where we visited,” White said. Three days of the brigade were spent setting up fully functioning medical clinics for the locals. One day, the group built five eco-stoves, which reduced carbon footprints and use special stones and solar panels to run. Another day, the group visited local homes alongside the Community Health Workers, who are the equivalent of state-tested nursing assistants, according to Slone. On the final day of the trip, the students visited a water brigade and went to an orphanage to spend time with the children. “We got to see many medical conditions you would not see in the United States. Everyone gained real shadowing experience and a greater understanding for other cultures and parts of the world,” Slone said. The UT chapter’s next brigade will take place in Nicaragua during winter break of the 2016-17 school year. For more information about the UT chapter of Global Medical Brigades, contact Slone at bailey.slone@rockets.utoledo.edu. This entry was posted on Friday, February 26th, 2016 at 3:05 am and is filed under Features, Medicine and Life Sciences, UToday .